Well, I did this thing where I waited around to write this review and now I'm not sure what to say. I wasn't sure what to say once I finished the book either, which is probably why it's taken me so long to do it. The Scorch Trials was just a really weird book for me. Thomas and co. wake up to find Teresa missing from the place they've been taken. After a weird guy shows up behind an invisible barrier, they learn that their trials are far from over and they'll have to spend the next two weeks trying to find a safe haven in the middle of a wasteland. Each of the characters is assigned a role - Minho is "The Leader," Newt is "The Glue," and Teresa is "The Betrayer." Unfortunately, Thomas is "To be killed by group B." There is also a new boy added to the Gladers - Aris from Group B, which is explained in much greater detail in The Scorch Trials. The pacing for the second Maze Runner book is about on par with the first - that is to say, it can be very slow at times. Maybe if I had read it instead of listening to it, it would have kept me turning pages to see what happened. Then again, maybe I would've given up halfway through. While the storyline is very interesting, I feel that it could have been written in a way that would have kept me more invested. I found myself not caring a heck of a lot when a character died or was injured... And the Cranks weren't nearly as terrifying as they should have been. On their way to the safe haven, the boys have to fight the elements, the Cranks, and more weird creatures created by Wicked. They meet two new characters, Brenda and Jorge, who help them through the Scorch. Wicked is unpredictable, helping when it fits their master plan and abandoning everyone in every other situation The Gladers eventually do find Teresa, who lives up to her new title, but might not be as bad as she seems. 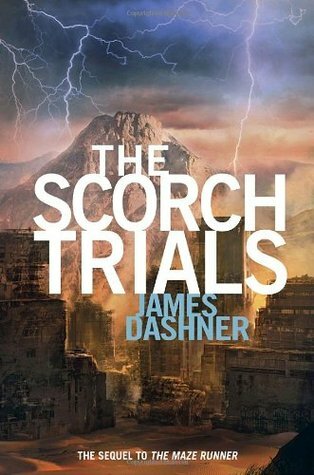 The ending of The Scorch Trials is just as weird as the rest of the book, introducing new monsters and hidden agendas. It remains to be seen if the Gladers really are through with their trials, but I'm not sure if I can muster enough interest to read The Death Cure. I'm surprised to say that I'm really enjoying the Maze Runner movie series (well, the one that's out) more than the books so far.